Water is the enemy #1 of all electronics. Simply put, water and computers don't mix. Heat is enemy #2. If anything goes wrong with the cooling system, your PC may take damage before you can turn it off. Any suggestions in this article contain the risk of severe property damage, injury, or death. I recommend staying away from the cooling system of your PC, particularly from your power supply. The power supply contains hazardous voltages and should be opened only by trained experts. If you perform any of the steps described in this article, you do so entirely at your own risk. If you are interested in overclocking, your best solution is to buy an all-in-one watercooling kit that contains pump, reservoir, radiator, fan, and the CPU water block. Use this integrated system to cool your CPU. This solution carries the lowest risk, has the lowest cost, and can be installed with the lowest effort. All water-cooling systems have a number of components in common, as shown in Figure 1. The water blocks are flow chambers with a copper or aluminum plate. The plate is brought in contact with the surface to be cooled, such as the CPU. Therefore, water blocks replace heatsinks. The warm water is carried to the radiator where a fan provides forced convection and removes the heat. A reservoir allows for easy maintenance, fluid removal and refill. The order of the components is not critical, but I found that placing the reservoir right before the pump facilitates removing the air from the system. 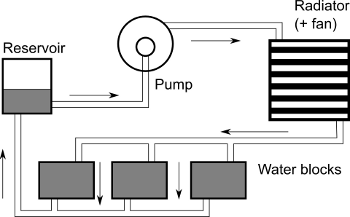 Figure 1: Basic schematic of a water-cooling system. The water blocks replace the heat sinks on the chips and carry away the heat generated by the chips. A radiator allows removal of the heat from the water. the reservoir allows for easy refilling and maintenance, and a pump keeps the water in motion. Let us review the individual components. Obviously, the water blocks are the most crucial components of the system. Water blocks are designed to replace the heat sinks (with their fans), and are therefore individually shaped, with appropriate mounting holes or springs. Water blocks are available for different CPUs (often, a CPU water block comes with mounting hardware for a number of CPUs), for the graphics chip, for some chipsets (a northbridge can generate considerable heat), for on-board MOSFETs, and even for RAM chips and hard disks. Water blocks can be custom built. See one report here. Some water blocks have to be custom built, such as the nothbridge water block for my ASUS motherboard, for which no commercial water block is available. I tried to mount an aluminum tube with a square cross-section onto an aluminum plate that had the same footprint as the heatsink. I used shapelock plastic and aquarium (silicone) glue to seal the ends. However, the water block sprung a tiny leak, which could have damaged the board. With this experience, I decided to buy as many water blocks as I could - in spite of the considerable costs. For the northbridge, I used a southbridge chipset cooler mounted on a custom-shaped aluminum plate. From this experience, I also learned that silicone glue is not the best solution to seal joints. Rather, I found JB Weld to be a more suitable glue. 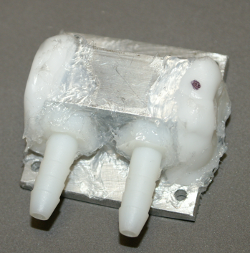 The water block shown in Figure 2 could likely be sealed properly with JB Weld instead of silicone glue. Figure 2: Home-made VGA water block. On a base plate of aluminum is mounted an aluminum tube of ~ 20 mm side length. The ends are closed with shapelock plastic and a generous amount of silicone glue. Two couplers for 3/8" tubing are threaded into the sides and sealed with silicone glue. The water block turned out to be efficient in cooling the VGA chip, but eventually sprung a leak. The pump is important to keep water flowing. It also needs to be chosen carefully because it will become the only moving component in the system, and therefore the only sound emitter. I decided to use a commercial PC water cooling pump. The pump was rated 16 dB sound emission, but in operation it appeared more like 40 dB. I have mounted it into a carpet-padded junction box for further sound suppression. In the end, the sole pump was significantly quieter than the PC with its three fans. However, in spite of the padding and in spite of soft rubber mounts, the pump remains audible, and I will pursue an alternative solution. It is possible to use aquarium pumps, but these are driven by AC current and cannot easily be controlled by the computer's power supply. On the other hand, aquarium pumps are submersible, and submersible pumps are potentially quieter than standalone pumps. I have read about the Eheim 1048 aquarium pump -- this could be worth a try. PC water cooling radiators can be purchased, often made to fit a tower case or even a 5.25" bay. None of these suited my purpose as all commercial radiators require a fan. I searched for a larger radiator and found heater radiators used in cars. They come in sizes of 7-8" and are generally larger and heavier than typical water cooling radiators (Figure 3). Such a radiator does not fit in the PC case, and a separate case needs to be used for the radiator. 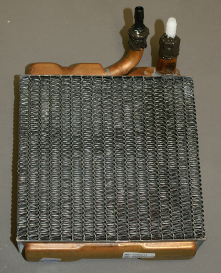 Figure 3: A car heater radiator. The inlet and outlet tubes have been fitted with couplers. Such a radiator has a larger surface area than typical PC radiators, yet free convection is still insufficient as this radiator is designed for forced convection. Although car radiators have a larger surface area than PC radiators, fanless operation causes the water to heat up noticeably above room temperature. A combination of the radiator with a 120 mm fan and a thermostat is a viable solution, because forced convection leads to very rapid cooling, even with minor air movement caused by a slow-moving fan. The reservoir is the least critical component. In fact, a water cooling system could probably work without a reservoir. However, a reservoir absorbs some of the thermal expansion of the fluid. It also allows for easy filling of the system and easier fluid replacement. I decided to use a T-225 cell culture flask (Figure 4), placed upright, and fitted with two couplers. The cell culture flask comes with a cap that is air-permeable, but has microscopic pores that don't allow mold or fungus spores to get into the system. The reservoir could also be a good place to introduce a temperature sensor or thermometer. 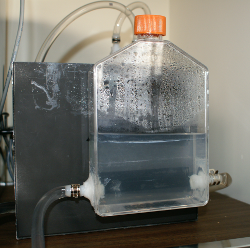 Figure 4: A reservoir made from a T-225 cell culture flask, two couplers, shapelock plastic, and lots of silicone glue. the transparent flask allows easy monitoring of the fluid level. Air bubbles that are carried from the tubing rise to the surface, and the pump draws air-free water. The two tubes visible behind the orange cap are not connected to the reservoir, but lead to the radiator instead. I use tubing with 3/8" inner diameter and 1/4" inner diameter (for the chipset branch). I found that fairly rigid vinyl tubing, available at Home Depot, performs better than soft Tygon tubing, which tends to collapse. Couplers and Y- or T-pieces are needed to create the branches that lead to the individual water blocks. Barb clamps are essential to prevent leaking. First of all, I decided to use a solid-state hard drive. Inside the PC case (Figure 5), there are no moving parts with the exception of a conspicuous fan attached to the power supply (more on that later). Cooled elements are the northbridge and southbridge chipsets, the CPU, and the VGA chip. Cooling these elements is sufficient to keep the inside of the PC case at a reasonable temperature. Other heat contributors are the MOSFETs of the on-board voltage regulators and the RAM. Their combined heat emission is negligible and easily transported out of the case by free convection. Figure 5: Tubing inside the PC case. Bottom-left are the quick-connect barbs that connect the PC part with the pump/radiator part. The flow branches to the chipset (thin 1/4" tubing) and, close to the CPU, also to the VGA chipset (darker Tygon tubing). The Y-branches to the VGA chipset are directed against the flow to allow the bulk of the flow to run through the CPU water block. 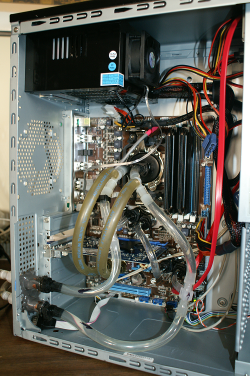 The external parts, i.e., radiator, pump and reservoir, are connected to the PC case with quick-connect barbs. Those can be readily detached, and they seal the openings when detached. This way, maintenance is facilitated, and the present cooling unit can be replaced by a more advanced one later. When filling the system, it is important to remove all air. Air can be trapped inside the waterblocks, impeding heat transfer from the chips. Air in the tubing or in the radiator impedes flow. I found it practical to "short-circuit" the external parts at the quick-connect barbs and first fill the reservoir and radiator with water, then remove all air from the radiator. Trapped air is audible, so it is easy to tell when all air is removed. Next, the PC is connected and the air is readily pushed out of the tubing and into the reservoir. Total fluid volume is approximately one liter. When filling the system, it is also important to check for leaks - with the motherboard turned off! A drop of water on the motherboard may cause some minor corrosion when allowed to dry. However, when the computer is powered on, electrolysis takes place, and contact corrosion may cause major damage. Ideally, flow and leakage are monitored over several days with the PC powered down, but the pump operating. The PC case can be turned sideways, so that drops fall away from the boards. I found that tube clamps are essential in preventing leakage. Also keep in mind that tubing gets softer and may slip when the water gets warmer. Ideally, test with hot water, or immerse the radiator in a bucket with hot water. During normal operation, the water equilibrates at 35C, and the CPU runs at 42C. It is typical that the chips are 5 - 10 degrees warmer than the water. With all four cores busy, the CPU can reach temperatures as high as 50 degrees, and the water slowly reaches 40 degrees, where the fan kicks in (see Monitoring Electronics below). The biggest challenge from this temperature comes from living things: mold, fungus, bacteria just love 35 to 37 degrees. To prevent growth, I put a small amount of Triton-X detergent into the water. If this turns out to be insufficient, I need to resort to tougher chemicals, such as paraformaldehyde. The only component that is not attached to the water cooling system, yet generates considerable heat, is the power supply. I strongly recommend drawing a line right here. Today's power supply units (PSU) come with relatively quiet fans, and the PSU fan can help drawing additional heat out of the PC case. Up to this point, the PSU fan is the only fan remaining. In fact, the radiator could be mounted behind the PSU in a fashion that air flow from the PSU also adds forced convection to the radiator. However, since my ambition is the fanless PC, I decided to pursue the question of the power supply further. I am aware of the deadly hazards of the PSU - the big primary filter capacitors carry 300-350 volts with enough energy to kill. This is no joke. Even with the unit unplugged, the residual charge on the primary filter capacitors can be lethal. An excellent introduction to safe handling of PSU can be found here. DO NOT OPEN A PSU WITHOUT KNOWING EXACTLY WHAT YOU ARE DEALING WITH! In my first attempt, I decided to replace the PSU's heatsinks by watercooled copper plates (Figure 6). I cut copper plates to size, bent them at the top end and sweat-soldered copper tubes to them. Then I drilled mounting holes for the semiconductors. I then removed the power transistors and the Schottky diodes from the PSU's PC board and mounted the components on my custom heatsinks. The components were then soldered back in place. 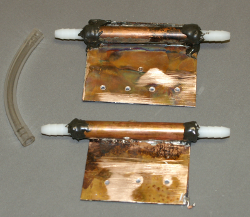 Figure 6: Water-cooled heatsink replacements for a power supply unit. Notice the small holes drilled into the copper plates. These are mounting holes for the switching transistors and for the Schottky diodes. As with the original heatsinks, any component must be isolated from the heatsink. The heatsinks must be connected to the ground wire for safety. Unfortunately, there is not much space inside the PSU housing, and I damaged a few small components. It took me a little time to replace those components, and the PSU worked again. However, I failed to notice that one isolator rubber had a small speck of solder lodged inside, which created a short between the transistor's collector and the grounded plate. Once I established the ground connection, the transistor went out in sparkling glory. I considered this PSU beyond repair, but did not give up yet. But I was definitively going to get a month's share of life-long learning - this time about design and repair of PSU. I decided on a two-pronged approach. I had an old PSU lying around that stopped working a long time ago and decided to attempt its repair, in the process replacing the original heatsinks by the watercooled heatsinks from Figure 6. Up to this point, I completely avoided repair of PSU because of the reasons given above. Unless I allow myself to deal with lethal voltages, I cannot measure anything on the primary side of the PSU. 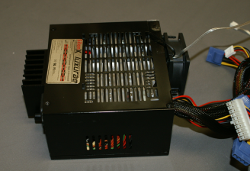 Meanwhile, I also turned to fan-less PSU's, which can easily be found on the Web (Figure 7). Admittedly, the fan that came with my fan-less PSU is one of the quieter ones, but calling this PSU fan-less? In operation, the fan is actually needed. Without any forced convection, the PSU easily reaches 60 degrees C, with some components likely being much hotter. I also noticed that the large secondary heatsinks were mounted poorly on the primary heatsinks. By adding thermal compound and carefully reassembling, I got more heat transferred to the outside. However, the fan - at its lowest setting - is still necessary. And once the "fan-less" PC case with its single fan is completely closed, heat accumulates inside and drives the temperature unnecessarily high. Figure 7: Fanless PSU with alleged zero dB. The PSU contains massive heatsinks inside, but the external heatsink (left side) appears to be too small to dissipate some 40 Watts by free convection. Consequently, the fan-less PSU came with a fan (right-hand side), slapped to the outside of the PSU almost like an afterthought. Needless to say, this PSU emits quite a lot more than zero decibels. One possible solution is to replace the heatsinks by an aluminum plate that is watercooled. The design of this specific PSU facilitates the attachment of a watercooled plate, but I did not anticipate one hazard of typical PSU - the primary-side heatsink carries a high voltage! Out of instinct, I never touch any component of a live PSU. I still assumed that the primary-side heatsink is grounded, like I knew the secondary-side heatsink is. Never assume anything when dealing with PSU. Fact is that all PSU I checked had their primary-side heatsink connected to the negative potential of the big electrolytic capacitors, and thus to the minus pin of the bridge rectifier. Therefore, the heatsink carries a potential of some hundred-something volts with respect to ground. Enough to zap you if you touch it. Why would anybody do this? The switching transistor is electrically isolated against the heatsink -- the designer could choose any potential, or, in my opinion, connect it to ground for highest safety. Yet, it is connected to the high-side DC minus. Maybe this has to do with EMI? A blown fuse later and a learning experience richer, I tested my idea that the heatsink may as well be connected to ground and found it to be true. I found no major damage from my previous mistake. The bridge rectifier survived thanks to the fuse, and other components were not involved in this short circuit. I removed the stud that connects the heatsink to the negative potential and grounded it instead. Works! EMI? I have no TV, so why would I care? The result can be seen in Figure 8. In the test environment, this PSU modification turns out to be surprisingly efficient, with the large aluminum plate barely rising above room temperature. However, in practice the PSU heats up too much, because the large heatsink in combination with the closed case design do not allow enough convection to dissipate heat from components that are not attached to the heatsink -- primarily the transformers and the inductors. We will revisit this power supply in Part 3 of this article. 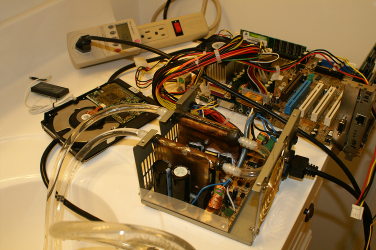 Figure 8: The "fanless" PSU with its upper heatsinks removed and replaced by a water-cooled aluminum plate. I re-attached the small primary-side heatsink for additional free convection, but completely removed the large heatsink that (poorly) connected to the case exterior. 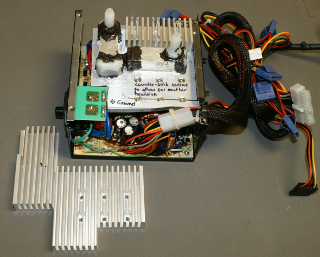 Notice that the exterior heatsink (visible in Figure 7) is no longer needed. Oh, and talking about poor design - did you notice that the fins are perpendicular to the air flow from the small exterior fan? In addition, I managed to repair the old PSU. To keep a long story short, I removed the primary-side transistors and found the main switching transistor dead, the B-C junction probably a mess of silicon slag. In the process of its self-destruction, the transistor took out the switching regulator IC (a 3842) and a reverse-biased quenching diode. I put the 5V-standby (5VSB) transistor back in place and found that the standby regulator started to work. Then, I replaced the destroyed components, replacing the old switching MOSFET by a more modern MOSFET that could handle a higher current. The PSU started operating again. Success - my first repaired PSU! When I mounted the new heatsinks (Figure 9), I also doubled the number of Schottky diodes and primary-switching MOSFET. Interestingly, the PCB layout allowed for that luxury. This means that the high currents are now divided over two components, thus reducing the load for each of the power components. In addition, the thermal load at the component is almost halved, because each component (now with half the current) is in contact with the heatsink. I also noticed that the main filter capacitors got warm, which indicates failing capacitors. I replaced them by using the capacitors from the PSU I initially killed. One really hot resistor remains. It is a 15k/5W resistor between DC plus and the MOSFET source, with approximately 340 volts across. Let's do the math. Current through the resistor is 22 mA, and therefore its power dissipation 7.7 Watts - for a 5W resistor. Did I mention poor design? Figure 9: The repaired old PSU in a testing environment. At a total load of 100W, some Schottky diodes get warm, but not hot. The primary switching MOSFETs do not heat up noticeably. As heat sources, the transformer, the filter inductors, and an ill-designed resistor remain. As an interesting aside, I am not the only geek trying to build a water-cooled power supply. The above-mentioned thermosiphon cooler by Jake von Slatt also features a water-cooled power supply. Coincidentally, the von Slatt power supply seems to be similar (but not identical) to mine. You'll probably think that I went overboard with the design. Maybe so, but keep in mind that the failure of the cooling system can severely damage the system, notably the CPU and the VGA chip. At this time, the PSU is dependent on the water cooling system as well. It is therefore reasonable to protect the system against a pump failure or low water level. But let's start at the beginning. To fill the water blocks and the tubing, and to test for leaks, it is desirable to run the pump with the PC turned off. Furthermore, the speed pulses from the pump should be fed into the CPU fan connector to trick the motherboard into thinking that there is an active CPU fan. An external 12V power supply is needed, and a simple circuit with two diodes connects the pump with the fan connector, and at the same time supplies alternative power from an external 12V wall supply. The radiator requires some form of thermostat, especially in summer, to allow rapid cooling when the water temperature exceeds a preset threshold. A very simple circuit would be a voltage divider where one resistor is a NTC temperature-dependent resistor. The NTC resistor decreases its resistance by some 5 percent for each degree C. If the NTC resistor is used as the top resistor of a voltage divider, the voltage-temperature curve becomes approximately linear within a limited temperature range (in a wider temperature range, the curve is rather sigmoidal). This voltage can be fed into a comparator, which in turn controls the fan. Next, I would like to generate a failure signal. Uninterruptible power supplies can generate a signal when the battery is about to expire, thus allowing the computer to gracefully shut down. In a similar fashion, the monitor circuitry could indicate a pump failure or flow failure and signal the PC to shut down. When we consider how crucial the cooling system is, this is not an unreasonable design goal. Let us take a look at part 1 of the schematic. It contains the actual microcontroller, a few LED, a transistor Q2 to control the pump, and a transistor pair Q1/Q3 to provide a pulse-width modulated signal to the radiator fan. INT0 and INT1 are inputs from the pulse monitors - INT0 for pulses from the pump, and INT1, not yet used, from a flow wheel. INT2 connects to a pushbutton switch. These signals go to the prototype board through connectors CONN2 and CONN3. Serial-port signals are routed to a serial port header through CONN1. Now let's move to part 2 of the schematic. The top right contains a RS232 line driver (U2, MAX232) that connects the microcontroller to the serial interface (J1). Note the extra line that drives the DSR signal. This signal can be used by monitoring programs (such as upsd) to initiate a shutdown. To the left is CONN4, which is a modular connector that allows field programming of the PIC chip. Note that the low-voltage series of the PIC18F13K50 requires reducing the programming voltage to 8V. Microchip offers a special programming header. In this circuit, R1 and Z1 serve the same purpose and allow to safely connect the ICD-2 programmer to the 18F13K50. CONN8 connects to the fan header on the computer main board. CONN7 supplies external 12V from a wall plug-in power supply. Power from either connector is routed through D1 and D2 to supply the circuit with 12V and, through U3, also with 5V. Furthermore, R5, R6, and Q2 provide a "computer on" signal that the microcontroller can read at RA5. The main pump, connected through CONN6, is controlled by Q2 on the first schematic, and its provides its RPM signal both to the PC and to the microcontroller. Through RB6 and Q1, the microcontroller can control an alarm piezo buzzer. The pulse-width modulated fan voltage is smoothed with C4. Note that the voltage characteristic of each fan is different. The 120mm fan I used reliably starts up with 3.5V and turns fairly quietly. Higher fan speed can be achieved with higher pulse width. Finally, R2 and R3 form a temperature-dependent voltage divider. The microcontroller can read the voltage through its internal ADC and convert it to a calibrated temperature. The sensor should be mounted on the radiator to allow monitoring of the coolant temperature. Notably, a similar voltage divider can be connected to another ADC input at RA4 -- this would allow to monitor a second point, such as the PC interior or the power supply. The software is written in PIC assembly. Download links are provided in Part3 of this article. So what did I finally decide to use? Read Part 2 to find out.